An exquisite solid sterling silver and stamped. 925 for sterling very large pendant and chain. In a lovely large display box. The Sterling Silver chain is finished with 2 more Aquamarine gemstones hand wire wrapped and a. 925 mark Sterling Silver round bolt clasp and ring. Truly stunning quality of gemstone. Aquamarine Faceted Rondelle Sterling Silver Bar Chain Necklace. A beautiful tiny genuine faceted aquamarine suspended on a 14k Rose gold filled chain. Gold filled jewellery must by law contain 1/20 which is 5% of gold by weight. (We also have a range of other services including ring engraving, jewellery cleaning, gold and silver restoration and valuation services. st Classed Signed For). 14K lobster clasp stamped 1/20 14K GF. Large Natural Aquamarine 9 K Gold Pendent On Chain F.s. 9ct Gold Filled 20 mm wide. Started in 2000, SUNRISE JEWELLERS (Indian Silver Jewellery 925) Us has flourished into one of the top manufacturers & exporters for gemstone studded silver jewelry & Sterling silver jewelry without gemstones. Glamourous Aquamarine Necklace. 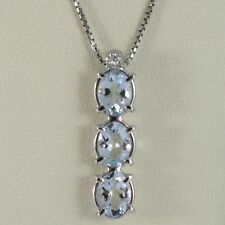 Beautiful aquamarine delicate fine silver chain. Each piece is handmade and unique. The stone structure may therefore slightly vary from the pictures. Total length: 40 cm. This is a beautiful Oval Alexandrite. Main Stone Alexandrite. All Sterling Silver is Rhodium plated and will never turn color. Secondary Stone Aquamarine. 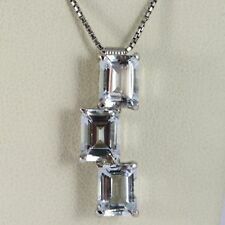 & Diamond pendant necklace. Main Stone Shape Oval. Tipo Catena. 750 WHITE GOLD NECKLACE, 18 K.
Tipo Catena. 750 WHITE GOLD NECKLACE, 18 K. Total weight, 1.8 grams. Birthstone March. BEAUTIFUL GENUINE AQUAMARINE STONE PENDENT. Secondary Stone Aquamarine. Main Stone Aquamarine. 6MM ROUND CUT STONE. CLASP Spring Clasp. Main Stone Creation Natural. SOLID 10KT GOLD FINE CHAIN. The object has 750 Gold logo and that of the factory. 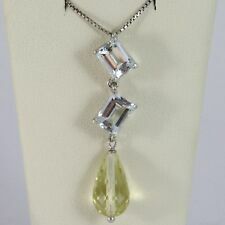 750 WHITE GOLD NECKLACE, 18 K. Pietra secondaria Quarzo lemon. Length 40 cm chain, 4.2 cm pendant. 750-18 k Gold material. Weight 6.0 grams. Tipo Catena. Pietra secondaria Pirite. Material Silver 925 (925 sterling silver). 925 SILVER NECKLACE. It has the mark of Silver 925. The object has 750 Gold logo and that of the factory. 750 WHITE GOLD NECKLACE, 18 K. Length 42 cm, 2.5 cm pendant chain. 750-18 k Gold material. Weight 5.9 grams. Oval cut 2.50 Carat stones, aquamarines, total and 3 1 round brilliant cut diamond, 0.02 Carat h color vvs1, purity. 750 WHITE GOLD NECKLACE, 18 K. The object has 750 Gold logo and that of the factory. 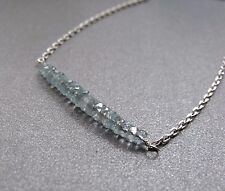 Beautiful natural aquamarine splitter chain approx. 45 cm long with lobster clasp. Cut form: Splitter(Nuggets). Beautiful natural aquamarine chain approx. Gemstone: Aquamarine. Lock: brass lobster clasp. All Sterling Silver is Rhodium plated and will never turn color. Secondary Stone Aquamarine. & Diamond pendant necklace. Set perfectly in Solid Sterling Silver. Main Stone Shape Oval. Gift box and Free chain. Tipo Catena. Material, Gold 750 18 CT princess cut Aquamarine, 1.03-carat, diamond, color g, purity, 0.01 carats. 750 WHITE GOLD NECKLACE, 18 K. Forma pietra principale Princess. Thickness 0.5 mm chain. This is a beautiful Oval Pink Sapphire. All Sterling Silver in this piece is Rhodium plated and will never turn color. Secondary Stone Aquamarine. 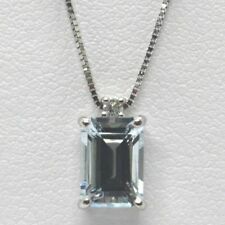 & Diamond pendant necklace. Main Stone Creation Pink Sapphire. 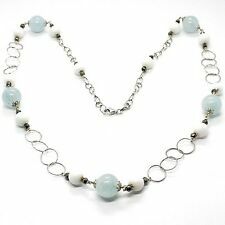 Necklace with aquamarines, Baroque, with magnetic clasp made of metal, length 45 cm (because it is a natural product variation of length are possible), width 10 mm, weight approx. 59.5 g * note the mass! The article can have on the photo bigger *. Splitter Size:5-8 mm. Aquamarine chain. A practical clasp makes for an easy on and taking off. Because each stone is a natural product. may cause small variations in form, color and pattern ! Splitter Size:6-8 mm. Aquamarine chain long. High-quality chain endlessly, without closure. Because each stone is a natural product. may cause small variations in form, color and pattern !